Waterloo – The Robert Langen Art Gallery at Wilfrid Laurier University is pleased to announce its new exhibit, Zaagi’idiwin: Silent, Unquestionable Act of Love, by Indigenous artist Leanna Marshall, running from February 26 to April 6, 2018. 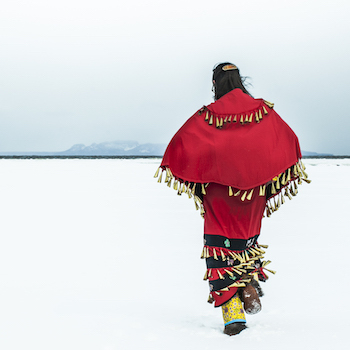 Zaagi’idiwin: Silent, Unquestionable Act of Love, is a mixed-media installation featuring traditional Indigenous jingle dresses (healing/story dresses). Through the making and documentation of the dresses, Marshall explores the stories that have shaped her family history in the context of Canadian history. “The social inequities, resistance and sadness told in these narratives serves as a springboard to examine the act of healing, compassion and forgiveness,” said Marshall. Leanna Marshall was born and raised in Thunder Bay, Ontario. She currently works as an Indigenous counsellor at Confederation College in Thunder Bay, where she is also a community activist. Members of the public are welcome to view the exhibition at the gallery, located in the Laurier library. A public opening reception will be held on Thursday, March 8 from 4-6 p.m.
To book a guided viewing, contact Suzanne Luke at sluke@wlu.ca or 519.884.0710 x3801. Visit the website for more details about the exhibition and for information about the opening reception. The Robert Langen Art Gallery (RLAG) is Wilfrid Laurier University’s visual arts centre. Working with a wide range of internal and external partners, RLAG oversees art collections and policies across Laurier’s multi-campus milieu and organizes visual arts programming that expands learning beyond the classroom. RLAG’s central space in the Waterloo campus Library hosts four exhibitions per year by leading artists; ancillary exhibit spaces are devoted to the work of students, community members, and emerging professionals. RLAG also oversees the university art collection of more than 1,000 works, including pieces by Henry Moore, Woldemar Neufeld and other masters. RLAG frequently tours its pieces and exhibits to locations throughout the university and surrounding communities for the enjoyment and benefit of all.